You may have thought about getting some gun training this year because you feel that you need to have some education in the do’s and don’ts of concealed carry. Maybe you thought about getting some gun training about firearm safety because you feel uneasy about your gun and your ability to handle it safely. Sometimes what you need is just to take a local advanced gun training skills class and get some new gun training ideas so that you have some new ideas about how to train. Changing the way you train with new gun training ideas is one way you keep interested in your training routine. Be creative, take someone with you so you can have a training partner. One easy routine you and your partner can do is the “colored circle target”. Any version of this target works. 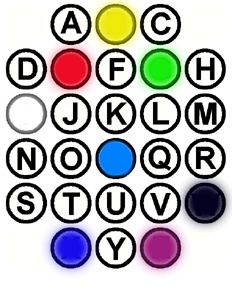 Load 5 rounds, start at the ready position, and have your partner call out the colors in random order. One shot at each color or letter. You can mix it up any way you want. You can also use different shapes i.e. (triangle,box,circle,numbers) and different size circles. Try running a shot timer. Remember to keep your target low enough so that you are not shooting at the ceiling ( your RANGE SAFETY OFFICER will appreciate that). You can have a lot of serious gun training fun with these ideas.